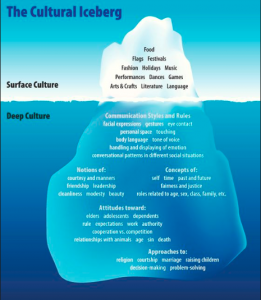 The “Cultural Iceberg” (attributed to G.R. Weaver) suggests that there are aspects of surface culture, readily apparent to outside observers such as food, flags, festivals, dances, games, fashion, art, etc., and aspects of deep culture, such as attitudes about education, approaches to religion, marriage, raising children, the elderly and communication styles and rules. 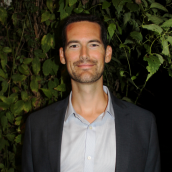 Although deep culture may, in fact, play a more significant role in the day-to-day lives of different people, deep culture is not easily observable without significant time with someone of a different culture or perhaps through experiences living overseas. And of course, aspects of deep culture would also vary between people of a particular culture. Deep culture is therefore not something that we will be able to feature prominently in our Multicultural Week; however, deep culture would be a great topic of discussion for families in exploring their own culture. The iceberg offers some entry points for an examination of a person or family’s beliefs that may be rooted in their culture. Accessed from OIC Moments on March 5, 2019.